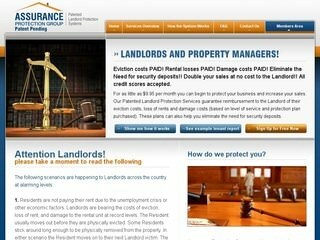 This brand new business combines revolutionary ideas with much needed services for landlords and property managers. Assurance Protection Group provides protection plans and other services which help protect landlords and property managers from eviction and damage costs while eliminating the need for collecting security deposits from tenants. We have also created the logo, full page magazine ad, two sister websites (Free Security Deposit and Free Tenant), three PowerPoint presentations, and other Internet marketing materials.